These look really striking, but are not in fact too difficult to make…so why not impress your friends and family. Place each of the 12 Ice Cream Cones onto a 12 hole muffin tin. Whisk the butter, sugar and vanilla extract together until pale and creamy. Add in the eggs one by one, mixing well after each addition. Sieve in the flour. Add the milk and food colouring and flavouring. Mix again until thoroughly combined, the mixture should be light and fluffy. Divide the mixture evenly between the cones, making sure the mixture goes to the bottom of each cone and does not drip down the sides. Place in the oven on the middle shelf for 20-25 minutes or until risen and springy to touch.You can test that they are cooked by inserting a clean cocktail stick into the center of each cake, if the cocktail stick comes out clean they are cooked. Leave to cool completely on a wire cooling rack. To make the buttercream, place the icing sugar, butter and vanilla extract and food colouring into a clean bowl and mix well. 8. Place the buttercream into a piping bag with a large star nozzle. 9. 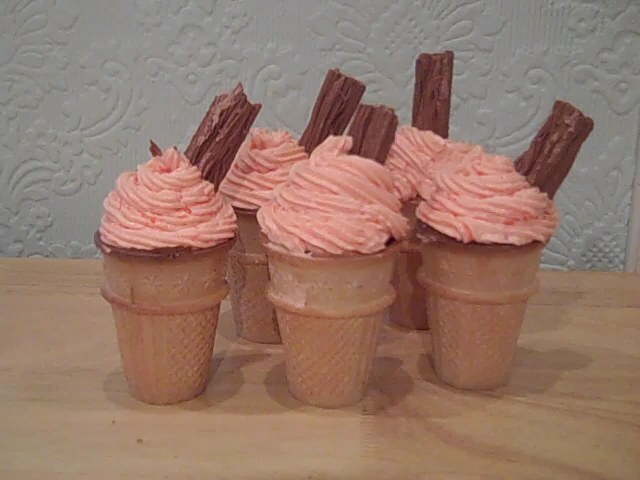 Swirl the buttercream onto each cup cake cone, starting from the outside edge working towards the center.